An 18-strong Chinese delegation, led by Xu Dazhe, Governor Hunan Provincial People's Government and Wang Qun, Secretary General Hunan Provincial People's Government, visited Institute of Technology Carlow yesterday for the purpose of forging stronger economic, educational and cultural links between Carlow and Hunan province in China. Hunan Province is located in South Central China and boasts a population of 67 million. Arriving at the Institute, the visitors were greeted by David Denieffe, Vice-President of Academic Affairs and Donal McAlister, International Affairs Manager, Institute of Technology Carlow. Mr. Denieffe provided the visitors with an informative presentation on the strong links between Institute of Technology Carlow and China. Dr. Patricia Mulcahy, President of Institute of Technology Carlow, presented the Governor of Hunan Province with a gift during his visit. The delegation was delighted to also meet with several Chinese undergraduate and postgraduate students who spoke warmly about their experiences as learners at Institute of Technology Carlow. The guests went on to visit Carlow College, Carlow Museum, Carlow Cathedral, Carlow Library and Visual before signing an official friendship agreement at a ceremony in Carlow town. Speaking during the visit, Mr. Denieffe said, “Institute of Technology Carlow enjoys a friendly, productive and rewarding relationship with several educational partners in China. 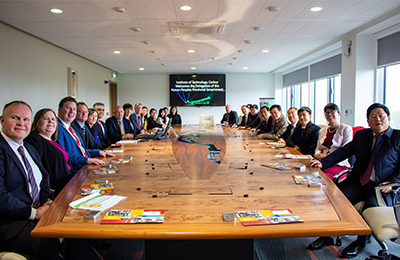 The agreement with County Carlow and Hunan Province will enable us to deepen ties with education partners in this province and enable us to promote Carlow as a place of opportunity for investment, education and culture”.